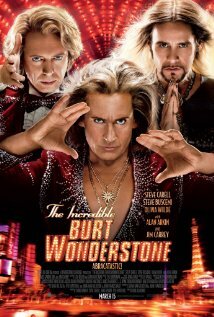 Title character Burt Wonderstone (Steve Carell) is a self made magician who discovered magic when he was given a Rance Holloway Magic Kit as a kid. He and his childhood friend Anton Marvelton (Steve Buscemi) have headlined a Vegas show for years, the only problem being that they've never changed their act and the Vegas crowds are growing tired of the same old show. Right about this same time, Steve Gray (Jim Carrey), a new breed of magician (think Chris Angel or David Blaine) is gaining popularity on the streets of Vegas with his crazy stunts. In an attempt to modernize their act, Anton puts together a trick/stunt called The Hot Box. Wonderstone's arrogance and inability to see the need to update their act leads him to have a breakdown in the middle of trick and leads not only to Anton's getting injured, but his quitting the duo. From there, the story follows Wonderstone as he loses his gig as a headlining act and is reduced to performing at a local assisted living facility where he rediscovers his love of magic and re-ignites the motivation that drove him to become a world famous magician in the first place. The story isn't anything unique (it's just a redemption story at its core), but the characters, and more importantly, the actors and actresses portraying them are very entertaining. Carell, Buscemi, and Carrey are perfect fits for their characters, and the likes of James Gandolfini (a Vegas hotel and casino owner), Olivia Wilde (Burt and Anton's assistant), Alan Arkin (magic legend Rance Holloway) and Jay Mohr (another down and out magician) all have their moments. I originally feared that all of the funny bits had been in the trailer, but I was pleasantly surprised by The Incredible Burt Wonderstone. I suppose I shouldn't be too surprised considering I tend to like most of the actors/actresses involved in it. The Incredible Burt Wonderstone is definitely in the same vein as Anchorman: The Legend of Ron Burgundy or Talladega Nights: The Ballad of Ricky Bobby. It's a ridiculous comedy that manages to tell a story with some morals behind it. I don't think that I would rank it quite as high as either of those two films, but if you like that sort of comedy, it is definitely worth giving a watch. - Slightly ironic that the bully picking on a young Burt at the beginning of the film is played by the same kid who plays the main character from the Diary of a Wimpy Kid movies (Zachary Gordon). - Wonderstone and Marvelton are obvious parodies of Siegfried and Roy, who also get a little more fun poked at them when another down on his luck magician keeps popping up with various injuries from the big cats involved in his act. - Alan Arkin continues the roll he is on of stealing the spotlight with his supporting performances His portrayal of Rance Holloway and his getting Burt turned around is wonderful. - The bit where Anton is trying to make a difference in a third world country by sharing magic with its children when 'all they want is food and water' is hilarious. - There was on bit that seemed to be a bit of a Talladega Nights rip off. At one point Burt says that someone can't take offense to what he said because he precluded it by saying 'no offense'. Ricky Bobby has a similar bit with the phrase 'with all due respect' in Talladega Nights.